23 Nov, 2017 by	Margaret M.
A man in California is going to prove that the earth is flat by launching himself into the air in his own home-made rocket. Well, that’s your first indication that the follow-up article we write on the 61 year-old screwball will no doubt include at least a trip to the hospital for burns when his homestyle “rocket nozzles” don’t work as intended. Hughes insists on running the experiment because he believes that the earth is flat and that astronauts and NASA have been lying to us by faking the spherical shape of the Earth. His research and rocketry is being funded by a group called Research Flat Earth. C’mon, we all know the earth is a cube. I know enough people in the engineering world to say that there’s a good reason why nobody designs, builds and flies their own rockets. Those are all very, very different things and while you might be able to assemble your own rocket and fly it if you have a few advanced degrees and years of training under your belt, it’s the design that’s trouble. Especially if, as Hughes claims, he plans on going 500 mph in the rocket. Given that it’s a $20,000 rocket, making it cheaper than a large number of new cars on the market, I’m concerned that he may have cut some corners. 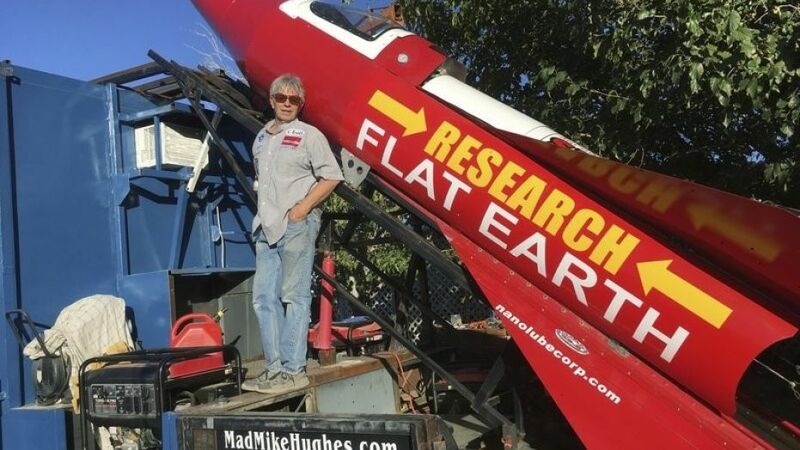 His plan is to launch himself up 1,800 ft. into the air, claiming that he will use his knowledge about “aerodynamics and fluid dynamics and how things move through the air” to finally “shut the doors on this ball Earth.” He runs his own flat earth podcast, too. While I think that the flat earth theory can be fun if you’re using it to poke fun around the fact that if you use pure logic, it is almost impossible to prove that the earth is flat. But of course, that’s why we have science. Even the ancient Greeks could use measurements to figure out that the earth is round and has a measurable circumference. But that’s science, which Hughes doesn’t believe in. But why is NASA lying to us? Thanks for clearing that up, Mike. Good luck. Here’s a four-minute GoPro video of his attempted rocket jump back in 2014, which left him injured.